Embroidered plastic dress by Simone Rocha and felt top with lacing by Tom Ford. Long-sleeve V-neck top by Céline. Embroidered dress by Meadham Kirchhoff and cotton bustier by Maison Martin Margiela. Sheer embroidered drop-waist pleated dress by Meadham Kirchhoff. Floral dress with corseting by Erdem and turtleneck by Bruno Cucinelli. 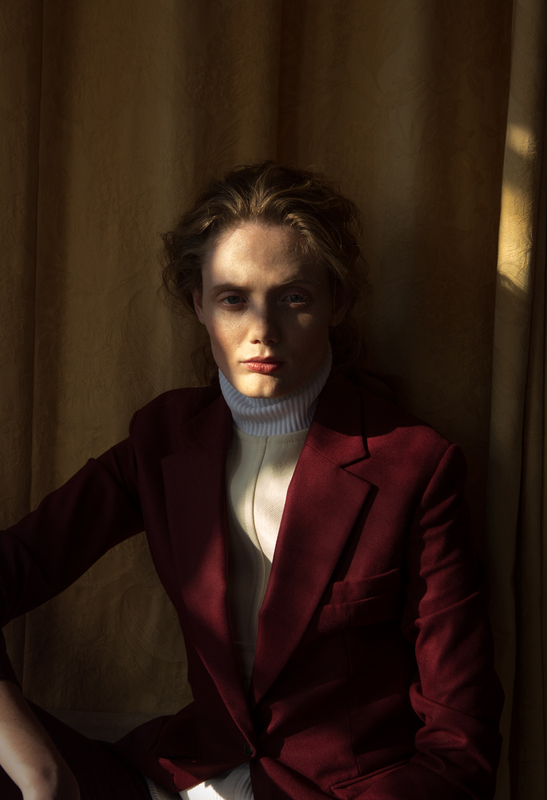 Wool coat by Emilia Wickstead and turtleneck by Bruno Cucinelli. : Sabine Mirlesse at SabineMirlesse.com. : Francesca Turner at Francesca-Turner.com. : David Wadlow for premierhairandmakeup.com. : Riona O’Sullivan at RionaOSullivan.co.uk. : Simon Lewis at CastandElect.com. Beauty Notes: Optimal Brightening concentrate, all day luminous powder foundation in Mont Blanc, Dual Intensity eyeshadow in Andromeda and Callisto, blush duo in Hungry Heart, sheer lipstick in Flair and lip gloss in Stella by Nars.